Apple on Thursday improved its security system for Apple ID accounts tied to services like iCloud and iTunes, offering users two-step verification for when making changes to an account. The feature began rolling out to Apple ID owners on Thursday, and allows those with accounts for services like iCloud, the iTunes Store, App Store and others to enable it on the Apple ID website. 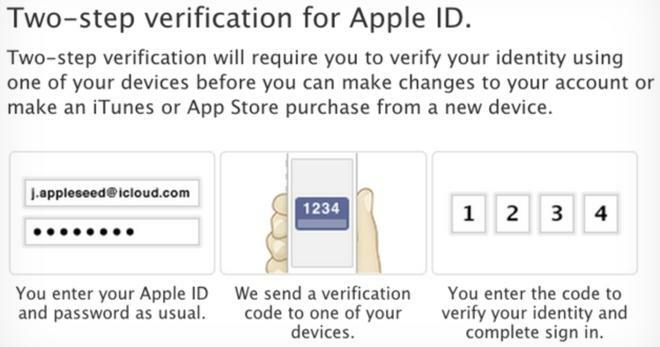 Once two-step verification has been turned on, a user can receive verification codes on their mobile device, such as an iPhone or iPad. On iOS devices, the codes are received via the Find My iPhone application, while other handset users can receive the code via text message. Once the code arrives, an iOS lock screen will display the notification that users must "unlock to view your verification code." Apple also offers users the ability to have a recovery key as a precaution, in the event that their mobile phone tied to the account is lost or stolen.